Wilmington Fibre has been manufacturing non-metallic material from our home in New Castle, Delaware for well over a century, which exemplifies our experience and expertise in non-metal CNC machining processes. 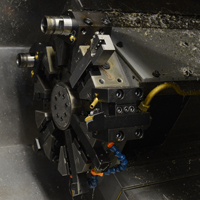 We are a one-stop shop, providing our extensive range of services in-house with our state-of-the-art vertical machining and turning centers, with CNC control capabilities and automatic bar feeding. We offer a wide range of non-metallic machining processes, including milling, drilling, boring, internal and external threading, tapping, thread milling, knurling, and counterboring, along with contour, form, taper, and straight turning services available. We can fabricate components into many different sizes; with parts available up to 48" long, up to 24" wide, up to 13" high, and with a diameter of to 30", with parts manufactured to tolerances of ±.001". We machine a diverse assortment of non-metallic materials, including Delrin®, PEEK, PTFE, Vulcanized Fibre, glass filled nylon, thermoplastics, phenolics, and many more. We have had production runs that have ranged from 1 to 10 thousand parts, with a 2 to 4 week typical lead time depending on quantity. And the quality of our work is shown in the high industry standards that we meet, including ASTM-D-710, MIL-I 24768, FDA, and AMS. To learn more about the non-metallic CNC milling, turning, and other manufacturing that is offered by Wilmington Fibre, see the table below or contact us directly.